Need to how to set a new timing belt and align it. The ignition timing on your vehicle is not adjustable. You can only check the timing to ensure it is correct. Looking for timing belt diagram and installation instructions. Refer to the belt routing diagrams site on this page. 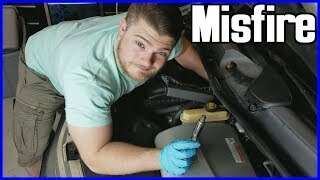 Will I need any special tools to replace a timing belt for 1998 Kia Sportage? Are there any special tricks to removal and installation? Disconnect negative battery cable. Remove two air ducts mounting bolts from radiator. Loosen fresh air duct clamp at intake housing. Remove hose at resonance chamber. Remove fresh air duct. Remove cooling fan shroud. Remove cooling fan clutch-to-pulley nuts. Remove accessory drive belts. Remove cooling fan and pulley. Remove lower engine splash guard. Remove crankshaft pulley from crankshaft. It is not necessary to remove center bolt. Remove upper and lower timing belt covers. See Fig. 1. 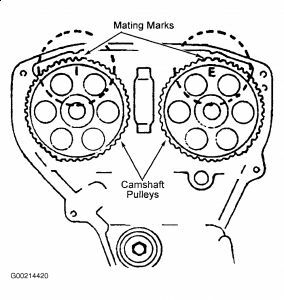 Rotate crankshaft to align camshaft and crankshaft timing marks. See Fig. 2 and Fig. 3. Camshaft "I" and "E" marks should align with marks on rear cover. Loosen tensioner pulley bolt. Pivot tensioner pulley outward to remove tension from timing belt, then retighten tensioner lock bolt. See Fig. 4. Mark timing belt rotation direction if old belt is to be reinstalled. Remove timing belt. Courtesy of KIA MOTORS AMERICA, INC. Ensure crankshaft and camshaft pulleys are still aligned. See Fig. 3. Install timing belt so that there is no looseness at tension side, and at camshaft pulleys. If reusing old belt, ensure belt is installed in original direction of rotation. Loosen tensioner pulley bolt. Turn crankshaft 2 revolutions in normal direction of rotation. Check that timing marks are correctly aligned. If timing marks are not correctly aligned, remove belt and realign. After realigning belt, repeat rotation prodecure. Turn crankshaft to align "S" mark of exhaust camshaft pulley with rear cover seal plate mating mark. Tighten tensioner pulley bolt. Check that belt deflection is.30-.33" (7.5-8.5 mm) with 22 lbs. (10 kg) of downward pressure on belt, midway between two camshaft pulleys. Install timing belt guide plate with flat side toward belt. Install timing belt covers. To complete installation, reverse removal procedure. Adjust drive belts to proper tension. How many times will a crank turn before both cams turn one time? What Is The Setting For A Timing Belt Settiing For This Kia? What Is The Diagnostic Process For A 2000 Kia Sportage 4wd, 4 Cylinder That Has A Code P0343-cam Position Sensor Circuit Voltage High? Four Cylinder Two Wheel Drive Automatic 108,000 Miles. How To Remove Bolts From Torque Converter?